Neem and Neem oil products as organic pesticide and insecticide. 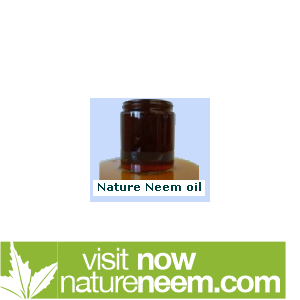 Buy neem products directly from Nature Neem, producers & exporters of neem products from India. Nature has blessed man with a number of wonders. Of all, plants are found to be its best boon. Among them, neem is distinguished by their astonishing versatility. Neem is such a fascinating tree that no other tree probably has provided wide range of benefits to mankind. Even a team of modern geneticists, agronomists, chemists and dieticians could not have engineered such a miracle say ‘The Neem tree’. That’s why the Hindu mythology has remarked that this tree should have been designed by a celestial committee. Neem (Azadirachta indica) is not only known for its herbal medicines and environmental friendly organic pesticides but also for its capabilities to balance ecological problems like deforestation, erosion and global warming. Owing to its capabilities, United Nations has rightly declared neem as "Tree of the 21st Century". Thanks to neem that has served our mankind from almost of the very beginning of known human history. This website discovers the wonders of neem, the best boon of Mother Nature to mankind. You could get informed about how neem is serving the different sectors like agriculture, medicine and cosmetics. Especially in the agricultural sector, the applications of neem as an important component of organic farming, as an organic pesticide and insecticide in integrated pest management system and organic agriculture is discussed. A separate section elaborates the different parts of neem and mode of applications as an effective botanical or organic pesticide. You could also get informed about the different commercial formulations of neem that are marketed by Nature Neem, one of the largest producers and exporters of neem based products with equipped R&D, from India. This official website of Nature neem will equally inform you about the best ways of buying different neem based products like pure cold pressed neem oil, water soluble formulation of neem oil used as organic pesticide, neem based organic fertilisers, need seed cake, neem based or neem enriched organic manures used in organic agriculture. The availability of other neem plant parts used in herbal medicines such as neem seeds, neem kernel powder, neem leaf extracts, neem bark powder etc., are also discussed.